The Long March rocket and Shenzhou spacecraft for China's next manned space mission are being readied for blastoff as soon as June from the country's Jiuquan launching base. Three astronauts will fly into space on the Shenzhou 9 mission, which will be China's fourth human spaceflight. Shenzhou 9 could carry China's first female space flier, according to state media. One official Chinese website indicated the mission would include a woman. The identities of the Shenzhou 9 crew members have not been announced, and the mission's duration remains secret. After launching from the Jiuquan space center in northwest China, the three-person crew will guide the Shenzhou 9 spaceship to a manual docking with the Tiangong 1 laboratory, a 34-foot-long module launched in September 2011. Shenzhou means divine vessel in Chinese. Tiangong translates to heavenly palace. Packed into shipping containers for the journey from a Beijing factory, components for the mission's Long March 2F rocket arrived at Jiuquan on May 9, according to the China Manned Space Engineering Office. The Long March rocket family is produced by the China Academy of Launch Vehicle Technology, or CALT, a division of the China Aerospace Science and Technology Corp., the state-owned contractor for the Chinese space program. According to the CALT website, the Long March 2F rocket for the Shenzhou 9 mission features dozens of upgrades to improve safety and reliability. Engineers will stack and test the rocket inside the vehicle assembly building at the military-run Jiuquan space center. The Long March 2F launcher, comprised of two stages and four liquid-fueled boosters, stands about 191 feet tall when fully assembled. The launch team will also load storable propellant into the rocket before liftoff, which is expected some time in June, July, or August. Based on the time necessary to prepare the rocket and Shenzhou spacecraft for launch, the flight could take off as soon as mid-June. The Shenzhou 9 spacecraft was delivered to Jiuquan on April 9 to begin its own set of launch preparations. After deployment from the Long March booster, the Shenzhou 9 spacecraft will chase the Tiangong 1 module in orbit for two days before docking. 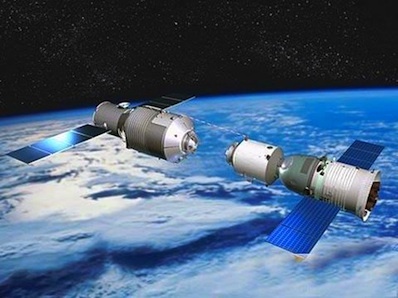 Shenzhou 9 and Tiangong 1 will form a combined spacecraft stretching approximately 60 feet long with more than 700 cubic feet of habitable volume. China accomplished the first docking in its manned space program in November, when the Shenzhou 8 spacecraft made two automated link-ups with no crew on-board. Once they dock with Tiangong 1, the Shenzhou 9 crew will enter the pressurized lab for several days to conduct experiments intended to lay the foundation for future Chinese space exploits, including the construction of a space station about the size of NASA's Skylab complex, which hosted three crews in 1973 and 1974. Another crewed flight in 2013 could follow Shenzhou 9 and dock with Tiangong 1. Chinese engineers are building a larger lab module, named Tiangong 2, for additional demonstrations. 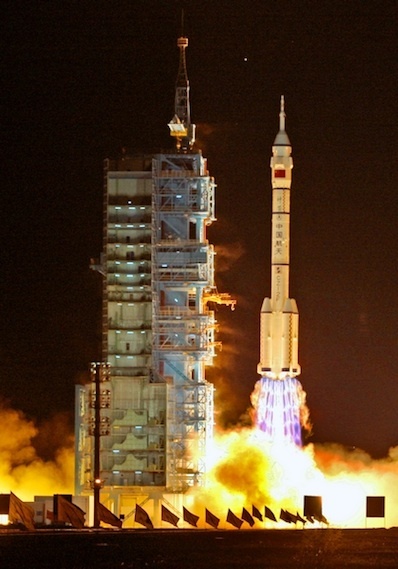 China aims to launch the first component of its space station by 2020. China's earlier Shenzhou missions include the country's first human spaceflight in 2003, a two-man, five-day voyage in 2005, and the first spacewalk of the Chinese program in 2008.